That's a beautiful quilt Debby. I LOVE the bright colors and the black background. Thank you for the supply list now. This way if we decide we're going to follow along, we'll be able to take advantage of any fabric sales now. Thanks! I have to think about this, so I like having the extra time. 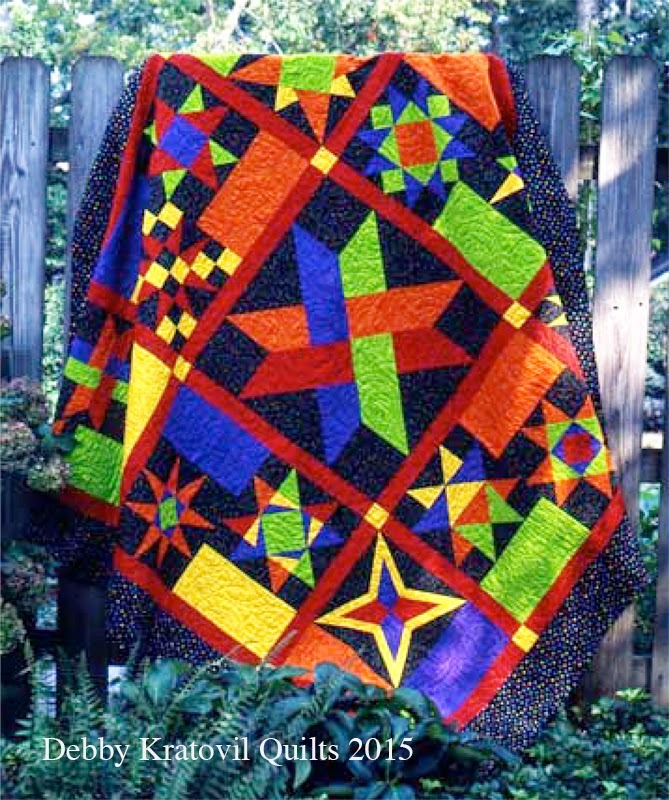 Such a beautiful quilt.These bright fabrics caught my eye! Such a beautiful quilt! Thank you for the supply list! Quilt shops here I come! I'm in. This is awesome. I will do it scrappy style. Thanks so much, Debby. I just read this so I hope to join in also. It is really pretty. Looks like fun! Count me in. Was just looking for a new project. Just received this. Beautiful quilt. Thanks Debby....I'm in. This will be fun. I'm all in for this one. Thanks for contacting the Expo students - I had a blast in your classes. I want to do this one. Where do we sign up? I just have to remember to come back here? Is there an email list so I can get the reminder? Ooooo looks like fun. I just got her new book a few weeks ago and love it! Ladies. If you're a no-reply blogger, I have NO WAY to contact you. To get notification of the monthly patterns, simply sign up to follow via email (see icon on the right sidebar of my main page). Then you will be notified whenever I add a new topic ONE OF WHICH will be each new pattern. Thanks so much for your interest! LOVE this design - I just wish the directions were more complete. I'm having to wing it with the sashing and borders, etc. as I assemble the blocks into a quilt. I made this quilt a couple of years ago pretty much following your color selections; when I entered it in the local quilt show recently, it won an Honorable Mention! I love the wonky stars and bright solids.